If this was ordinary times, we would be getting a break for the next week and a half, but based on my experience of the last couple of days – not to mention the near-universal Intuition that we’re near the End of whatever Age we’ve been in – that won’t be happening. Uranus Stands Still and turns Direct Square to the New Moon on Thursday the 13th. Let’s run through that more slowly – Uranus (our Soul Connection, or Yin Integrity) Stands Still (is very Strong) and turns Direct (spilling out all of the Individuality and Creativity we’ve been holding back since mid-July) Square (Challenging but very Rewarding) to the New Moon (Reboot) on Thursday the 13th (as Pogo would have said, Friday the 13th falls on a Thursday this month). Without the stutter, December is about letting go of any inhibitions we have about allowing our Light to Shine Brightly. Folks who go into mid-December Unconsciously will be doing a lot of “Whoa, did I say that?” by the 15th. Or not noticing that they’ve been through a personality transplant – as Kesey described it, sometimes you can trip out so far that you never get back to know that you left. That’s a generous view, as Uranus usually represents Disruption to a life lived Unconsciously. Normally, we’d expect a Uranus Station to be felt something like 2-7 days prior to the event, but in this case it will behoove us to plan ahead. So let’s start with some background that might be handy. Sleep. Don’t worry about it. If you usually monitor the clock to see when and how long you sleep, forget it. For all kinds of reasons, Uranus does NOT do linear time. If you need to keep to a schedule, Prayer is probably your best bet – Great Spirit, may I please awake rested and alert at 6:45 am? – that sort of thing. Sleep deprivation is cumulative, but you may be surprised at how well a Prayer of that sort works on a few hours sleep. Trance. You may well find yourself in a Reverse Lucid Dreaming state. In a Lucid Dream, you let your Ego screw around with your Dreams. Since Dreams are one of our richest sources of information about the Unconscious, information that’s vital to our Survival, Lucid Dreaming is like urinating on the Dragon. In a Reverse Lucid Dream, you’re awake, but you also aren’t. It feels like you’ve never slept, because you’ve been at Full Attention all night, but you’ve been in a Deep Trance, probably without conscious control of your muscles. Deep Trance can be as restorative as Deep Sleep, or more so. You may also find yourself walking around in Trance when you’re awake. Like the feeling you get when you’ve taken antihistamines for a while, like there’s a thick sheet of glass between you and the World you’re walking in. Everything you see may be funny or pathetic or poignant, and you can connect only to people who are in the same Trance. You may not know that you’ve crossed the Veil into a parallel lifetime, unless you notice the signs. It’s like watching a very intense movie, and feeling as though you’re still in the movie after you leave the theater. You may or may not actually say things that you’d never expect yourself to say out loud, but you’re probably conscious of the difference. Yintegrity. Yang Integrity is when you do what you said you were going to do. Yin Integrity is when you do what you feel like doing, moment to moment. To make Yin Integrity work in a Yang World without making us look flibbertigibbet or flaky, we need to minimize commitments, renegotiate them when appropriate, and make amends when we run afoul of Yang Integrity. Usually, for sheer practicality, this involves reducing the scale of our relationships. At least some degree of Yin Integrity is necessary when we operate Intuitively, follow our Guidance, or respond to Synchronicity. Yang Integrity becomes more and more difficult to maintain as the pace of Change accelerates (aka 2012). Disruption. Yes. What gets Disrupted, is that which is no longer in harmony with the new download from the Soul. If it sneaks up on you, there’s not much you can do except to be as honest as you can in renegotiating and reorganizing your Life. If you have any advance notice (such as hating to do something), the sooner you start reorganizing, the easier it will be. Don’t throw out any Babies with the bathwater or burn any bridges – when you tap on your hatred for something, it may turn out that it’s your hatred that’s on the chopping block, rather than what you hated doing. The Empty Chair game that Clint used so well to sabotage the Retropublican Convention would be a great process to use on any strong negative emotions. Every part of our Reality is there for a purpose, but natural inertia can produce tenacious obsolescence. Spirit, Energy, Body, Mind, Emotion are not separate Levels of our Existence; they are different Perspectives on our Existence. Our Existence is unitary. There are certainly circumstances where the bars of our Birdcage are so thoroughly cemented in place that we can’t find a passageway between the Perspectives, and so come to believe that, for instance, “disease” in the Body must be dealt with using chemical or surgical means. But don’t confuse your Karmic limitations with Reality. Deal with Fear first, before you resort to other approaches. Rise of the Guardians is a great seminar on Fear, as well as a fabulous movie. Death. As we’ve often said, the only Death there is, is Ego Death, the rest is only transition, transformation, Trance(Re)Formation. A strong Uranus produces nothing if not Ego Death – it’s necessary to muscle the bouncer Ego aside in order to make room for new knowledge of the Soul Self. The Ego’s function is to keep us Alive and Safe – no fault there. But like anything in hardcopy Reality, it can become ossified. If Fear or premonitions of Death arise, it would be a good time to recognize your lack of omnipotence, and give it over to a Higher Power. Ask for Safety, and trust that Prayers are always answered. Blame. Blame is the hardest of all, because it is a complete Worldview. Blame and Responsibility sit side by side, like the two Earths, with very little to connect them. From the Blame Worldview, Responsibility means Blame. There are two metaphors that work, but they seldom crack the shell of Blame. In workshops Katie Hendricks used to tack a hundred-dollar bill to the wall and ask, Who’s Responsible for this? After several rounds of she-did-that he-did-this, someone would just get up and remove it. Responsibility is the Ability to Respond, simply. It’s not about the past, it’s about the future. It’s not who-did-it, it’s what-are-you-going-to-do-about-it? Blame looks backward, Responsibility looks forward. Blame will tack you to the wall, where you’re unable to Respond to your Soul’s requests – or demands. Healing. When you’re making friends with a Wild Critter, you don’t approach it directly. You do something you hope will please it, and then make yourself available to it. You sit down nearby, without facing it directly. You open space for it to approach you. Then you wait, patiently, until it feels safe enough to come forward. That will involve fits and starts; it approaches a little, you move and spook it, and you have to start over tomorrow. So it takes a while. It’s like Grief, it has its own timetable. Inviting home the parts of yourself that you rejected (or your significant others rejected and you eventually collaborated) works like that. We don’t have a lot of time here, but remember that Healing is a Magnetic process. You PIAVA, Change the Subject, and wait while remaining vigilant for additional information. Soul Loss. Hank Wesselman and Jill Kuykendall give three causes for dis-ease: Disharmony, Fear, and Soul Loss. Acute or Chronic Trauma can cause a Portion of us to seek a permanent hideout. Like any part of the Unconscious, our Lost Portion can take over our personality at times, making us much younger and less socialized, or even Wild. We can redefine some aspects of Soul Loss as Post-Traumatic Stress Discomfort, and there are effective tapping protocols for PTSD. Any Uranian download is going to trigger some part of our Soul Loss – exacerbate PTSD symptoms – either because the downloaded Soul Energy requests reunification of the Prodigal Portion, or because the download compensates for the Loss. It may be useful to consider the Soul Loss to have a valid psychic function, and apply Clint’s Empty Chair to it. Karma. We don’t know whether the Challenges that face us are personal or global. For instance, the young man who came into my Dreams this morning, knocking on the door offering to sell me a plant but obviously there to seek alms, then leaving in tears when I was unable to help him. Was this a symbol for the World’s Scarcity, or a symbol of my own Scarcity, or Both/And? I can only know by imagining myself to be the youth, and waiting to see how that evolves. Thanks to Messiah Mom for the introductory image. By the way, the Moon Occults (hides) Jupiter at 4 minutes past 5pm PST tomorrow. That would be pretty fantastic to see, though my back-of-an-envelope (literally) calculation puts it somewhere near Wake Island in the western Pacific. Cosmologists theorize something called Inflation, when the Universe supposed expanded by zillions of times in a grillionth of a second. Imagine if our Dreams were to do that! I can’t think of a better metaphor for an Occultation of Jupiter than that sort of unfathomable expansion in our self-knowledge and self-confidence. I’ve been saying “Tuesday’s Eclipse,” but it actually occurs on Wednesday, at quarter to 7am PST. “Later, I understood why I had had to deal with the blockages and traumas related to the bodily dimension of my being first of all. Until then I had been in the habit of conducting my communication with the divine realms on the spiritual level, mostly using the path of meditation. The Goddess, to the contrary, speaks a language of manifestation, the language of life embodied. Her messages do not originate in any distant source ‘outside’ our being. They ascend from the deepest levels of the elemental soul within one’s body towards its surface, to the point where they can be perceived and understood by one’s consciousness. “I would be awoken in the middle of the night to feel a special vibration extending around me and also within me. After a while, the vibrating quality would start to coalesce within me till I myself became an embodiment of the quality, not just on the emotional but also nearly on the bodily level. In this way I was able to come face to face with and recognize the different facets of the Goddess, which ancient people knew and communicated with, but which to the modern mind are mere concepts derived from the study of archaeological finds. “The most exquisite was my experience of the creative aspect of the Life-Giving Goddess… First, I could feel a gigantic vortex of magma spiraling just below her sexual organs. At its margins, the fiery life-power of the vortex was constantly crystallizing till a thin and precious layer of fertile soil began to form within her hips. This enabled all kinds of vegetation to grow… In the next instant I realized that her belly was composed of all the different species of animals… The higher level was achieved by the whales and dolphins who even jumped over the barrier formed by the elevation of her breasts to touch the area of the head. I’ve left out the …juicier portions… to give you incentive to read the rest of the book. 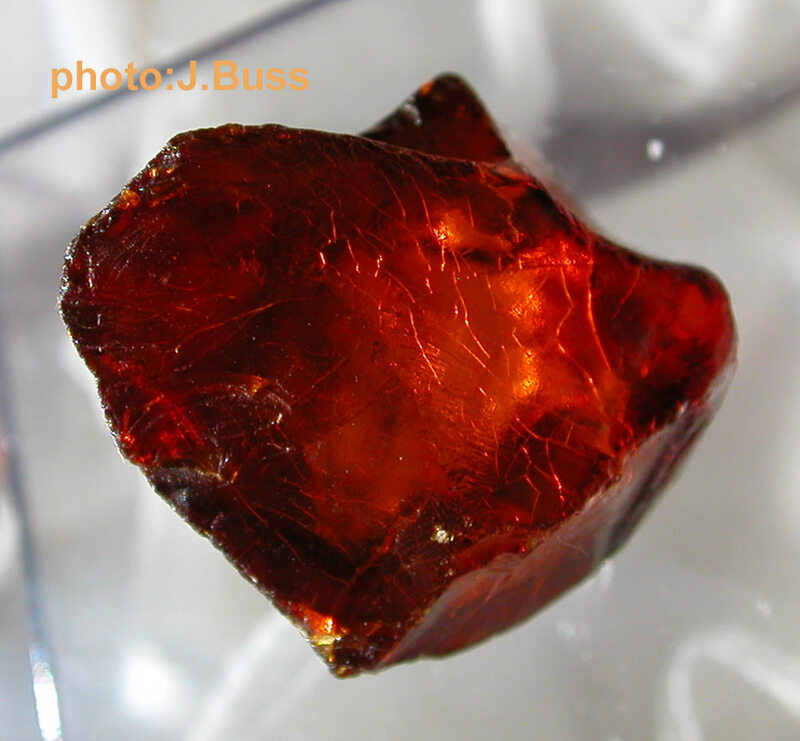 A geologist would call that Succinite, but we’d call it Baltic Amber. Even fossilized, it’s still just hydrocarbons – lifestuff. It’s metaphysical function is very close to what Marko’s been talking about. The red form is very grounding. So Juli is a Poster Child for this Eclipse! Juli, if you had one thing to say to the World right now, what would it be? First thing that springs to mind, no editing! Actually, if you have several things to say, that’d be great – but don’t leave out the first thing that came to mind (chances are you told yourself it was silly or wrong – most of us usually do that to our best Intuitions)! Okay, so far we have a very complex Finger of God pointing straight at the Eclipsed Moon, implying that our reactions will be quite Curious. Something to do with Action and Values and the Goddess. Did we mention that the Mars-Action player is Out of Bounds (Strong)? Or that the Eclipsed Moon Conjunct Lilith (more Emergence of the Deep Feminine) is also Conjunct Jupiter (ie, Amplified)? This is Big, even as it’s too complex to easily pigeonhole. What else? Three Challenges and three Graces. We still live under a Big Grand Trine (Big Grace), though it’s about to finish up. It’s about Focusing on what’s most important to us and building a sustainable future around it. In fact, it’s time to Act on it. The Deep Feminine is highly involved in this. The Grand Trine is between Venus-Saturn (Focusing on what’s most important), Ceres (Sustainability or Sustenance), and Chiron-Neptune (the New Paradigm that will evolve after money fails). Ceres is Out of Bounds (Stronger). In addition, Mars-Pluto (Action) opposes Ceres, forming a Kite. Notice that Venus-Saturn and Mars-Pluto are arms of the Finger of God with the Moon and Lilith. Door #1 and Door #2 lead into the same room. We’re asked again (in case you haven’t noticed, it’s a big theme these days) to express our Individuality, in ways that are probably a little challenging, but also highly rewarding. Basically, you can’t afford to avoid telling anyone what it is you really want, because in one way or another we always get what we ask for, and this is for keeps. Don’t hold back! Uranus (our Soul Connection or True Self) forms a T-Square (Mastery through Challenge) with Mars-Pluto (Transformative Action or Trance-Breaking Action) and an Out-of-Bounds Ceres (the for keeps part). Door #3 also leads into the same room as Doors #1 and #2. Since Mars-Pluto and Ceres form the spine of the Kite, this puts a huge emphasis on the Vacancy opposite Uranus, as that Vacancy would complete a Grand Cross perfectly aligned with the Grand Trine, were it filled. The Vacancy is Libra 5, “A man revealing to his students the foundation of an inner knowledge upon which a ‘New World’ could be built.” Isn’t that heavy – we “just happen to be” Co-Creating a New World as we speak. It would behoove to PIAVA our Guides to lead us to the Revelation! If you asked me for a hint about what to look for that no longer works, I’d say look for the places where you depend on Logic. When the Paradigm changes, Assumptions change, and Logic is simply a house of cards built upon Assumptions, usually unstated. That’s why we can be so easily manipulated by Logicians – they make so much sense that we don’t notice that their Assumptions are murderous. It’s called Rhetoric, as distinguished from Communication. Fox News glories in it. When Assumptions shift, it becomes meaningless. That redness in the neck moves to the face when they catch themselves in their own contradictions. Not that “Liberals” don’t have rhetoric as well, they’re just lousy at it. Now, as we move into a space governed by Intuition instead, we discover that we all have different Assumptions, because we all have different Values! Logic is what they spoke in Babel. The Eclipse (New Awareness), which consists of the Moon Opposing the Sun, is Squared (Mastery through Challenge) by Chiron-Neptune (the New Paradigm) – with the Moon about to be Initiated by Lilith (the Deep Feminine, including Intuition). Again, Door #4 leads into the same room! Since Chiron-Neptune is a corner of the Grand Trine, this T-Square would form another Grand Cross in perfect alignment with the Grand Trine, if there were a planet Opposite Chiron-Neptune. That makes the Vacancy very important; it’s at 6 Virgo, “A Merry-Go-Round.” The implication is that we already know what we need to do; we’ve been here before! We just need to recycle that experience. Fundamentalism isn’t just for Moslems and Old-Testament “Christians.” A fundamentalist is anyone who believes that their metaphors are literally true, whether the metaphor is Evolution or Genesis or Jihad or 47% Moochers. Our Beliefs are discovered, not decided or adopted through brainwashing. And we know them to be Approximations – useful metaphors. Odds, if you like. Chances are, that gas station a half-mile down the road is still there; it was there yesterday. But if you think you know for sure it’s there, you’re either Misguided or Intuiting. It could have burned down last night, or been abducted by Aliens. Our Challenge is about setting Boundaries to protect ourself from people who take their metaphor so seriously that they believe we need to share them or else – like the Tea Party fundamentalists in the US Congress. The first Grace is that our sense of our own Mission will make it pretty easy to know when and how to set such a Boundary. The second Grace is that we know intuitively when to recoil from proseletyzing. In fact, we’ll probably be pretty sarcastic about it! We might actually help someone become aware of their fundamentalism, if we do it just right. Juno (Identity) Opposes (Awareness) Vesta (what we know to be Sacred) at the Eclipse. With luck, through this we could come to know that We Are Not Our Beliefs. Just because someone else has different Beliefs, that needn’t threaten our Ego – in fact, it could be interesting! Pallas (Boundaries) makes a T-Square (Mastery through Challenge) with this Opposition. That’s the Challenge, setting Boundaries against proselytizers of any stripe. Pallas is also Trine (Grace) to the Moon’s North Node (our Mission). The second Grace is a Trine from Eris (the Deep Feminine) to Juno (Identity). Pallas also Trines that Stationary Mercury, which in turn Quincunxes Vesta – we could encounter some very big surprises about our Beliefs here! All in all, because everything is so tightly interrelated with almost everything else (Door #5 is the only one that’s independent), this will probably be a much more momentous (not horrendous) Full Moon than the last two. Door #5 may bring some resolution to the Polarization that’s crippled every attempt to be constructive since the turn of the Century. As for the other four interlaced Doors – Curiosity, Grace, Individuation, the New Paradigm – there are a lot of hanging chads there, but no Gitmos. Anything could happen, but I’ll wager most of it will be constructive. Ah, Nephrite Jade, what a Healer! Big Sur Jade, polished smooth by the waves. 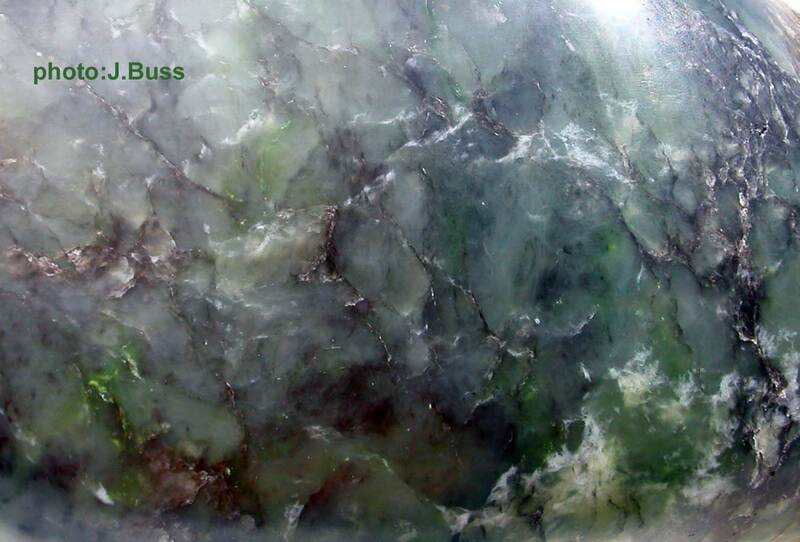 Nephrite is a fairly simple Mineral – Calcium Inosilicate with Magnesium (green) and Iron (blue-black) laced in. Grounding Iron, calming Magnesium, and omnipotent Calcium. We’d still be Bacteria without Calcium. When Mars lights up we’d only be able to wiggle our flagella. In an Inosilicate, the Silicate groups form pairs. Silicates get much more complex than this. But what makes Jade so solid for carving is the way the Silicate pairs are knitted together, like the Angles in the Eclipse chart. Derivatives are of course now many times larger than they were in 2010, still opaque, and still unregulated. The same players still advise Obama. Of course, the US is doing the same thing – “Quantitative Easing” it’s called. Why would these folks want to build up such a dangerous house of cards, anyway? That’s easy. These masters of financial sleight of hand get paid millions, by the month. All they need to do is book a flight to the Cayman Islands, where their accumulating millions are already stashed, just before the house collapses. As I understand it, in France the Judge often sits with the Jury to try to piece the facts together, because their primary agenda is to arrive at the Truth. In England, folks are held to the Spirit of the Law. But in the US, folks are held to the Letter of the Law. So ever-expanding regulations are but a moving target for the brightest sociopaths. Everyone’s ancestors in the US “got rich doing what hadn’t been declared illegal yet,” and now their descendants are enjoying the same privilege. But now the laws are written by lobbyists for the wealthy, so they write in their own loopholes. It’s kinda like a jet engine winding up to speed for takeoff – but it’s not attached to the plane. You can be sure that once the house of cards falls, it’ll be these same folks who write the rules for the new game, while we remain locked in the engineless fuselage. TSA rules – you aren’t allowed off the plane. If enough folks wise up to this charade while the People still have a little power left, then a Chironic Miracle could well befall us. If not, then Community, Invisibility, and Sustenance are probably our best hope. 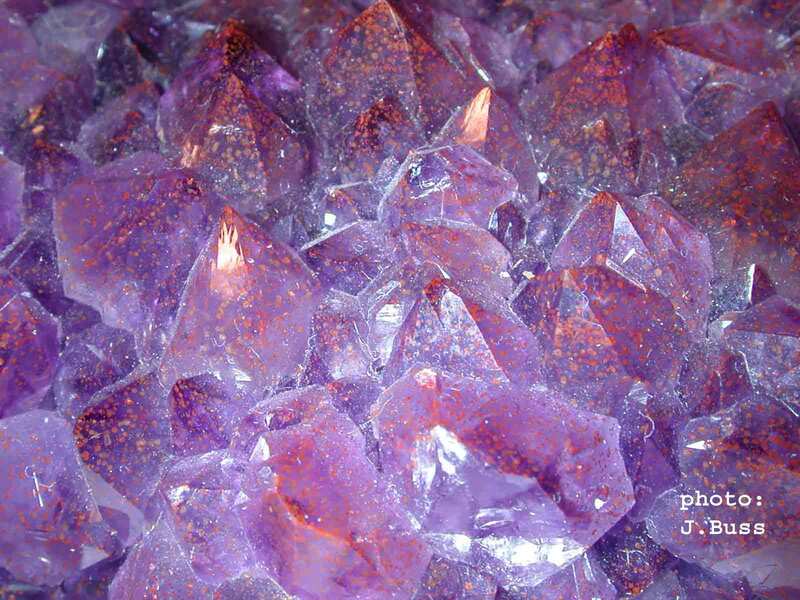 Amethyst, the Violet form of Quartz, is the Crystal that most commonly represents the Crown Chakra. Here, as it often is when it lives near Thunder Bay Ontario, it’s speckled measles-like with Hematite, providing grounding to the Root Chakra. Walking the Mystical Path with Practical Feet, as Angie would put it. Fresh Violets in an Ancient Pottery Bowl is the Sabian Symbol of the new Chiron-Neptune Cycle – this is how we Co-Create Miracles for the next half-century. Nourished with water from a Sacred Well, and symbolizing a half-century of peaceful collaboration among Humans and all of the other Sentient Beings on and around our Planet. Wouldn’t that be great! Okay then, what about this Mars-Pluto Event? First, Mars is Out of Bounds (Strong). The Initiation occurs at 9 degrees of Capricorn, “In a sun-lit home, domesticated Birds sing happily.” That’s intense. With Uranus prominent, domestication is the last way to seek happiness (except as Resistance to Uranian Energy, and good luck with that). Rudhyar rubs it in, “The wholesome happiness which subservience to the ideals and patterns of a well-established culture brings to those who accept them unreservedly.” This is the Mars-Pluto Cycle that reigns until November 2014. Know of any well-established cultures that promote self-expression, freedom, and independence? Maybe we should all move there. I know, that’s the hype about the US, and it’s true, within limits. To Uranus-Pluto, limits are a dare. It’s sad, as it may indicate that those who are enjoying the spoils of the Olde Order will be shocked (as Rmoney was when he lost) that anyone would want to disrupt their reverie. On the other hand, they may be too shocked to put up much of a fight. Lord knows, they might even be willing to collaborate to bring more people out of poverty and injustice and slavery. We don’t want to overlook any possibilities for Chironic miracles! And Elizabeth points out that the Mars-Pluto Square will activate a whole generation born in the 1950s (because it Squares their natal Eris) to defend their “entitlements” – they’ve paid into Social Security and Medicare “Trust Funds” all their life so they could enjoy the fruits of those investments when they retire. Of course they weren’t Trust Funds, they were Slush Funds for Congress to squander. And now the 1% have relabeled those investments as “entitlements,” and even “liberals” have fallen into using the derogatory term. If Mars-Pluto inspires these Gray Panthers, woe to the Tea Party and their fascist-collaborating ways. Meanwhile, Mercury is Stationary turning Direct this coming Monday at quarter to 3pm PST. A Mercury Station strongly highlights communication. The Station occurs at 19 degrees of Scorpio, “A Parrot repeats the conversation he has heard.” Rudhyar considers that an opportunity to transmit knowledge beyond what we understand, like when we tell people All There Is Is Now. If that’s what’s relevant, great. In my cynicism, I worry more about rhetoric – parroting of unexamined propaganda, like “entitlements.” Maybe we can hope that the Station will engender Awareness of the empty flammability of rhetoric. However, we should be looking at the path traced out by the Retrogradation of Mercury, more than the degree of the Stations. Mercury crossed 19 Scorpio to 5 Sagittarius from mid-October to election day, then backed across the same zone for most of November, and now it will recross the same span again till mid-December. When this happens, the Heavens are telling us to Pay Attention! to this particular section of the Zodiac. It’s the Cancer (Nurturing) Decanate (a third of a Sign) of Scorpio (Fearlessness) and the Sadge and Capricorn Dwads (one twelfth of a Sign) of Sadge (Surrender). During early October, Mercury taught us to dig deep into our Circumstances looking for Limiting Beliefs (the Scorpio Decanate of Scorpio). Then in mid-October, Mercury asked us to know no Emotional Limits in this search (the Pisces Decanate). The last third of Scorpio (the Cancer Decanate), at the end of October, was about healing the negative Karma that we’d found by empathizing with our historical selves as they were thrown to the Wolves unprepared. You poor dear, you had no way of dealing with that when you were six years old! You did the best you could, it was not at all your fault! If you missed this healing opportunity, even after our November Retrograde review, you now get a third chance to allow Grace into your Life. The Sagittarian portion (the first half of November) was about Oh my God, the walls are gone! This is what Freedom feels like! (the Sadge Dwad of Sadge) and What will I do with this fabulous gift? (the Capricorn Dwad). We’ll get into that zone again December 11-13. Watch for it. A new Venus-Saturn Cycle is also Initiated Monday, at quarter after 5pm PST. Venus-Saturn Events and Cycles are about Focusing (Saturn) on our Values (Venus). What are we always offended about? This initiation is at 7 degrees of Scorpio, “Deep-Sea divers.” More Pearl-diving. You can see the benefit of Consciousness – this is about looking fearlessly for First Cause, and without Consciousness we’ll be looking outside of ourself, and getting lost in Blame. Venus isn’t about setting Boundaries (that’s Pallas) or what’s Sacred (Vesta), it’s “just” our Values. So we’re more likely to enjoy a bitchfest than to throw rocks. However, get a bunch of folks together enjoying the same complaints, and rocks are likely to begin flying. Especially if the folks are unemployed. When you ain’t got nothing, you ain’t got nothing left to lose. The Venus-Saturn Event occurs before the Mars-Pluto Initiation; this means that however our desire for Justice (Mars-Pluto) and our desire for Stability (domesticated Birds singing) rank among our Values, they’re both likely to be Strong now. And the Venus-Saturn Initiation is Sextile (Creative Grace) to the Mars-Pluto Initiation. That gives us excellent prospects for Creative Win-Wins, where Justice (in this case, largely the right to Food and Shelter) is extended without the Violence that diminishes everyone and makes Justice ever harder to achieve. The Mercury Station (Awareness) is Novile (one ninth of the way around the Zodiac) to the Mars-Pluto Initiation. The Novile represents introspection, again de-emphasizing the potential for more Violence. The Venus-Saturn and Mars-Pluto Initiations combine various stages of several Cycles. The Venus-Mars, Venus-Pluto, and Saturn-Pluto Cycles are in their Voids, at the Waning Sextile. A Void, recall, is the zone in a Cycle where the Energy has peaked, and we need to release Expectations in order to clear Space for a new Cycle. Waning Sextiles are about finding Creative ways to compensate for the loss of the benefits of the prior Cycles. These might be Giving up excuses in favor of Honesty (Venus-Mars, September 2008, A boat landing after a Storm), Giving up Power-Over in favor of Listening (Venus-Pluto, December 2011, A veiled prophet speaks), and Giving up Ease in favor of Sustainability (Saturn-Pluto, November 1982, An old bridge over a beautiful Stream). The Mars-Saturn Cycle is at its Waxing Sextile stage. At this stage, if we’re Conscious about it, we’re finding Creative ways to implement the Cycle’s Energy, even though our culture isn’t supporting it yet. Mars-Saturn is about Focusing our Energy so our Actions are efficient, and the Cycle is about “The sight of an Autumn leaf brings to a Pilgrim the sudden revelation of the Mystery of Life and Death” (Initiation August 15, 2012). Whoa, more loss of the Veil, as presaged by Neptune-Ketu in the 1/1/2000 chart. If we aren’t Conscious about it, we’ll be in Resistance to Rebirth. Well, the Venus-Saturn Conjunction and the Mars-Pluto Conjunction form a Finger of God pointing at the Eclipsing Moon. Uhhhhh, that Strong! as Tatsuya Nakadai would have said in translation had they put Fingers of God and Eclipses into those old Samurai movies. A Finger of God or Yod, recall, is two Quincunxes pointing at the same zodiacal location. A Quincunx is two Planets five Signs apart. Quincunxes represents Curiosity. Curiosity is akin to Wonder and Awe, the highest mental state we can achieve, as it is free of Fear. Better than Gratitude, and Gratitude is pretty dang high! Arguably even better than Love, as Love is blind, while Curiosity is fully Conscious. Of course we want all three, not Either/Or! We might call that combination Compassion, or Presence. We may be Open to new ways to foster Sustainable Abundance by balancing defense of Social Stability with our own Soul-Searching. Where is it that I don’t serve Sustainability? How can I contribute to Justice and Equality? Eclipses are about Awareness. We may want to PIAVA these questions to our Guides. In Celtic traditions, the Well is the entrance to the Underworld, the Worlds beyond the Veil where the Ancestors and the Faeries dwell. We can’t Heal the Planet without re-integrating these Entities into our Worldview, as they represent Connectedness with the Living Spirit of Planetary Stuff, and the Oneness of Time. If you don’t already know that Broccoli is a Spiritual Entity, let along Amethyst, you need to seek an education. It’s about surrendering our Egoic acquisitiveness in favor of Universal Equality. No one is Free until we’re all Free, including Freedom from hunger, and Freedom from disrespect. Denying the Spirituality of Other is tremendously disrespectful. At the Eclipse the Moon closely Conjoins Black Moon Lilith, symbol of the Primordial Feminine, Goddess of the Underworld. The Moon’s orbit forms an ellipse, an oval with two centers. The Earth is at one center. The other is Black Moon Lilith. Recall those stories about Two Earths? So we really have three close Conjunctions all mutually Quincunx – Venus-Saturn, Mars-Pluto, and Moon-Lilith. Curiosity about what Actions (Mars) We Collectively (Pluto) will take to Support (Saturn) our primary Value (Venus) of Protecting the Spirit (the Well) and Form (Moon) of our Mother Planet (Lilith). The Moon-Lilith Conjunction is still forming at the time of the Eclipse – the Moon crosses Lilith about four hours after the Eclipse. That is, the Energy of this month-long Moon-Lilith Cycle will carry on during the nine months that the Eclipse remains influential. The Initiation occurs at 9 Gemini, “A quiver filled with arrows.” In Psalm 127 the arrows remain in the quiver, but their presence still protects the gate. So what if the well-established culture that Mars-Pluto defends is not the nastily-politicized TV-adled traffic-snarled lawn-order culture that we live in every day with other Humans, but the larger culture that nurtures us, mostly without our Gratitude or even our Curiosity, or Respect for their Sentience and their Service. Our collaboration with the Cows and Turkeys and Yams and Brussels Sprouts and Pumpkins who serve themselves at our banquets here in the Restaurant at the End of the Universe, for instance. Maybe that’s what Mars-Pluto defends. In the context of the Waxing Square of the Ouija-Board Uranus-Pluto Cycle, that makes much more sense! One of the things I’ve observed in 40-plus years of relating astrological configurations to Human endeavors and the circumstances that surround them (which of course are All One), is that Consciousness trumps traditional negative astrology. For instance, Uranus Squaring Pluto should be hellishly chaotic, even horrendous, as traditional Western astrology labels Uranus as Disruptive, Pluto as Death, and the Square as Difficulty. The way to convert Negativity or Fear to Truth, is to ask who’s doing the negating, and what’s their agenda. Fritz Perls revolutionized psychology by suggesting you do just that with your own negative and self-sabotaging voices. When we do this, Uranus becomes Soul Integrity, Pluto becomes Transformation, and the Square becomes Mastery through Challenge. When we approach 2012 with the notion that whatever is out of Integrity with our Soul will be disrupted, that whatever is Dying is really being Transformed for the better, and that whatever appears Difficult is an opportunity that leads to Mastery, the World changes. Traditional negative astrology is simply the view from Ego that clings to the status quo. Now if we didn’t know that Uranus was Squaring Pluto, the circumstances of 2012 could easily feel like a major freak-out, because rather than looking forward with Curiosity to the Changes that will bring us deeper Integrity with our Soul (Uranus) and with the flow of History and Herstory (Pluto), we’d be looking at the World from the status quo‘s perspective, and the status quo is scheduled for a Death drama of Shakespearean dimensions. Let’s take “Transits” for another example. Not the astronomical version of a Transit, like when Venus Walked across the Face of the Sun last June, but the astrological version, like Mars crossing Pluto this coming Tuesday at a little after noon PST. An astrological Transit is simply two planets in the Sky forming one of several significant Angles to one another, or a planet in the Sky forming a significant Angle to one of your natal planetary positions. We put more effort into interpreting the Cycle that the Mars-Pluto Conjunction Initiates, but the Event itself is important as well. The Energy that the Cycle will promote is lit up at the Conjunction or Initiation, then goes underground until the Waxing Square. As for the Event itself (and this is true of Squares and other Angles as well as Conjunctions), the Energy builds gradually up to the moment of the Event, and then, if we’re conscious of it, falls off very rapidly. Since Mars is Action and Pluto is Mandatory, a common Egoic reaction to a Mars-Pluto Event is Anger, since Anger motivates Action better than most other emotions. The length of the build-up to the Event depends on our sensitivity, whether the Event triggers hot spots in our natal chart, the Strength of the planets involved, and what else is going on. If you’d like a single number for pre-Event build-ups, you’ll be right more often than wrong if you call it a week. Many astrologers measure a planet’s Strength by how close the planet is to us, because the closer it is, the more obvious are its impacts. They’d consider Mars-Pluto significant because Mars is very close to us. I measure Strength by how far the planet is from us, because the farther it is, the more Unconscious is the Energy, and the more control it has over us. Another way to look at that is, how often do we get practice at dealing with the Energy. For example, most of us will see only one Uranus-Pluto Square in our lifetime, so we’ll have limited experience with that Energy in the current life. On the other hand, Mars-Pluto Conjunctions recur every two years or so, so we have little naivete around that Energy. We consider a Mars-Pluto Event to be fairly Strong. And we would expect it to be pretty revelatory, as it should reveal, through our Anger or other calls to Action (Mars), what’s going on at the Planetary level of the Unconscious (Pluto). Think about what’s made you Angry or Inspired over the last several days, and watch to see what Angers or Inspires you between now and Tuesday. Long way of saying, that since those of us here are now Conscious of Tuesday’s Mars-Pluto Event, the Energy will be dropping off fairly quickly, and won’t necessarily be Strong in Wednesday’s Eclipse. If the Eclipse were to occur just before the Mars-Pluto Event, that’d be a whole ‘nother story, as the Eclipse would be strongly colored by unrestrained Mars-Pluto Energy. In this case, there are several other good reasons why Mars-Pluto colors the Eclipse (which we’ll get to later), so we won’t ignore it by any means. Nevertheless, Mars-Pluto won’t be the primary color of the Eclipse. Now, what happens if we are not Conscious of the Event? Then, rather than noticing that there is Anger or other Inspiration afoot on the Planet, we’re much more likely to personalize the Energy. For instance, as I was preparing to write this, I was thinking about someone who should be supporting me and isn’t (in my perception), and I noticed that I was Angry about that. If I weren’t Conscious that Mars-Pluto is upon us, I’d be vowing to confront that person and get the situation amended. Or, if I didn’t feel like it would behoove to do that, I might get depressed (Anger turned inward against the Self) about it and draw conclusions about my own Incompetence. Either way, I’d be making decisions under the influence of the Transiting Energy, rather than making decisions about objective Reality. Those decisions will carry the Mars-Pluto Energy forward into the rest of my time on the Planet, and quite possibly into “future” lifetimes as well. That carries a very heavy implication – every Mars-Pluto Event is a golden opportunity to release all of the negative decisions you’ve ever made under previous Mars-Pluto or similar Events! Imagine yourself in one of the World’s many hot spots this weekend. You have every reason to be Angry and called to Action. And those Actions will probably change your life in significant ways. On the other hand, if you were Conscious that this is a Mars-Pluto weekend, you might be instead asking yourself, “Wow, Power is Afoot here – I wonder what would be the most effective way to exert my own agenda here?” Everyone’s own agenda is Justice. The problem isn’t agendas, the problem is failing to see Win-Win. For instance, Mercury is still Retrograde, which increases the likelihood that your arguments and Actions will be misunderstood. Mercury goes Direct on Monday (at quarter to 3pm PST). That’ll make Monday a very powerful day to speak up and be heard, especially if you’re willing to allow your protagonists to also speak up and be heard, so you can understand one another and get to Curiosity about how you can collaborate creatively to achieve both your objectives and theirs. (Manganotantalite would serve you well.) If you’ve already decided that their picture of Justice is wrong, or already torched their garage, your chances of getting to Curiosity and Win-Win are small and falling. The classic example of carrying the Energy of an Event forward by locking transient Energy into decisions, is 9/11. The Saturn-Pluto Energy (which feels like someone has their thumb on your head if you’re Unconscious, and leads to the recognition of what’s Most Important if you’re Conscious) was actually fading fast in September 2011, but the Neocons worked very hard to continue that Energy, and they did an excellent job. Every time you get X-rayed or groped at the airport, you’re re-experiencing those decisions! How many of us are Conscious of that?